Well known for its delicious sweets and bhujia (traditional Indian savory), Bikaner is a town still holding its old world charm. It was founded five centuries ago by Rao Bikaji. It was named after its founder. Most of the establishments in Bikaner were built in the traditional Rajput style of architecture using fine quality yellow and red sandstone. It is a modern city and the Mughals as well as the British contributed a lot in its modernization. It is popularly known as the Camel Country. The towering fort was built by the ruler of Bikaner in the 16th century. This unconquered fort has several beautiful buildings such as Moon Palace, Phool Palace, Karan Mahal, Rang Mahal and Anup Mahal, Har Mandir and a museum displaying the treasured possessions like manuscripts, carpets, jewelry, weapons and jars. It is one of its kind camel farm in Asia dedicated to research on camel breeding for commercial purposes. Its foundation was laid by Indian Council of Agricultural Research in 1984. 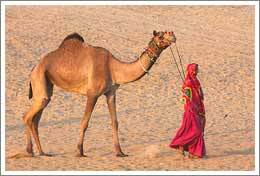 The farm is of great help to the people of Rajasthan as camel is an integral part of their day today activities. This temple is very popular as it is an abode of thousands of rats who are worshiped here. They do not harm anyone and are considered holy. The camel festival of Bikaner entices thousands of tourists every year. It is held in January and the festival is packed with several camel sports & competitions besides dance and music performances. Gangaur (dedicated to the worship of Lord Shiva and his consort Goddess Parvati for long and happy married life) festival is celebrated with great passion in Bikaner. The miniature paintings of Bikaner are admired by one and all for their distinctive style. The bazaars of Bikaner offer beautiful handicrafts, leather items, jewelry and paintings. Jodhpur Airport is the nearest airport which is 235 km from Bikaner. Indian Railways connect Bikaner with Delhi, Jaipur, Jodhpur, Kolkata and Bhatinda. It can also be accessed by road from all the major cities of India.